Ik ben eigenlijk al super vaak in Eindhoven geweest. Mijn moeder, grootmoeder en ik gaan daar altijd naartoe om te shoppen. Het is een klein uurtje rijden vanuit Antwerpen, ideaal dus. Meer dan het winkel centrum had ik dus nog nooit gezien, tijd om Eindhoven eens écht te ontdekken! Ik had er absoluut geen idee van dat Eindhoven zoveel te bieden heeft. Mijn vriend en ik waren allebei enorm verrast door deze leuke stad. We verbleven in The Student Hotel. 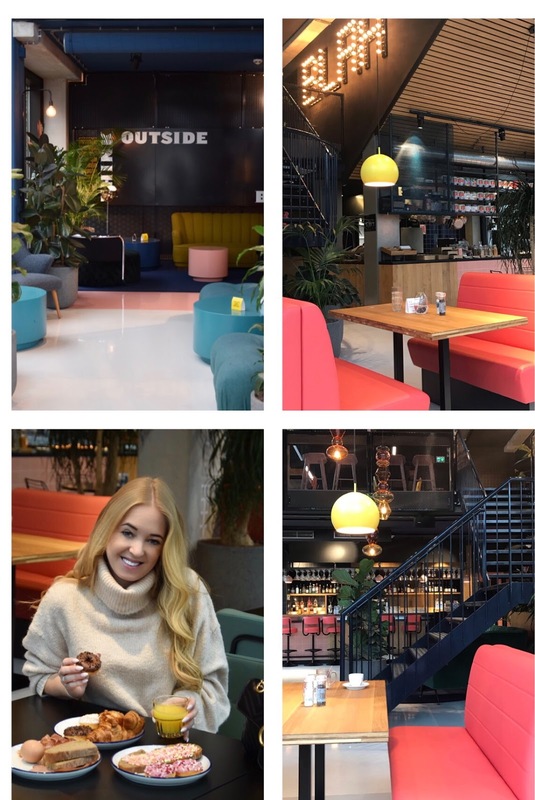 Een super hip hotel midden in het centrum van Eindhoven. De ligging is echt ideaal. De winkels, station en heel wat restaurantjes liggen op wandelafstand van het hotel. Het hotel heeft ook een eigen parking waar je voor €15 per nacht kan parkeren, wat naar mijn mening echt niet duur is midden in het centrum. Leuk weetje: In dit hotel verblijven écht internationale studenten die in Eindhoven komen studeren. You have some trends that always make a comeback after a few years, for example, the cowboy boots. You hate them or you love them, and I love them! I have to say I was not immediately convinced, but the more I saw them, the more I liked them. I have played it safe and went for taupe-colored boots. A neutral color that matches with a lot. You of course have them in all kind of colours and prints. I combined them now with an oversized sweater dress and a long coat. Combining boots like this with jeans is still a huge challenge for me, I certainly not yet succeeded in this. I am sure that I will wear them a lot in Spring. I really like them best under a dress. Below you can see two looks with the cowboy boots. The first time I combined them with my long oversized Isabel Marant sweater and a classic beige coat. The second look with a loose dress with a turtleneck and a teddy jacket. Which look do you guys like the most? Outfit: New day, New teddy. It's the end of January already, time flies! That means the sale is coming to an end again and the new collection is arriving in stores. Time to shop! I'm not really into sale shopping. All the fuss and mess everywhere, nothing for me! For my work as a mobile merchandiser I constantly visit stores, and last week this teddy coat caught my eye. I know, I already have 562726 teddy's, one more can't do any harm, right? It was in sale and only €39.99, so you will understand that I had to take it! So far my sale purchases this season..
Time for the new collection! These black boots are already from the new collection and I found them at Manfield shoes. Who follows me on instagram has probably noticed that I often wear this brand, especially the black boots I found there last year. The new ones are with a lower heel and some details on the back of the boots. Super pretty! Shoes you can wear every day, super comfortable and yet classy because of the small heel and the pointed toe.